MONTGOMERY, Alabama — Desperation is setting in on the Democratic side of the U.S. Senate race here in Alabama, as radical leftist Democrat Doug Jones races across the state with a series of last-second campaign events with just days to go before the polls close. 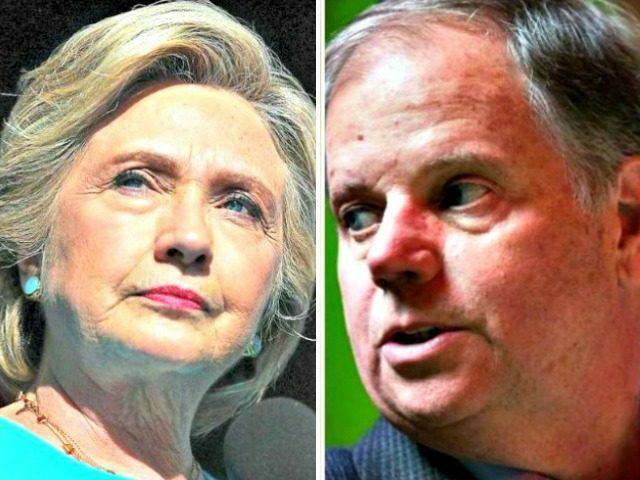 The decision by Jones to throw down with national black Democrats here at the last second in Alabama in the closing days of the race shows the problem he has in the black community–similar to the one failed 2016 Democratic presidential nominee Hillary Rodham Clinton faced last year nationally–with a serious lack of enthusiasm. This threatens to further cut into his support among politically middle-of-the-road white voters in Alabama’s affluent suburbs. Jones, who will face off in Tuesday’s special U.S. Senate election against conservative Republican Roy Moore, is sprinting around the state on Saturday after canceling campaign events in Birmingham on Friday due to rare unexpected snowfall in Alabama. But, given Moore’s resurgence in the polls after the full discrediting of the allegations against him due to the revelations that activist attorney Gloria Allred’s client forged a yearbook inscription she originally attributed to Moore, it seems unlikely that there is anything Jones can do to pull this race off. Millions upon millions of dollars have poured into Alabama, streaming from operatives connected with former President Barack Obama and leftist organizations, as well as from top so-called Never Trump groups aimed at derailing Moore. But the conservative firebrand has proven resilient, earning the official support this week from President Donald Trump that culminated in a close-enough-to-Alabama rally in Pensacola, Florida, on Friday night, where the commander-in-chief threw his full public support behind Moore’s senate campaign. Trump is expected to record robocalls for Moore’s get-out-the-vote operation, which would likely–along with another upcoming rally with former White House chief strategist Stephen K. Bannon and Rep. Louie Gohmert (R-TX)–give Moore everything he needs to power across the finish line to a victory in deep red, deep south Alabama on Tuesday. Jones stumped Saturday with New Jersey’s junior senator, Cory Booker, something breathlessly reported by leftist media personnel as some kind of a boon for his radical leftwing campaign against Alabama values. He also appeared with former Massachusetts Gov. Deval Patrick. Jones has been desperately seeking to energize black voters in Alabama, as enthusiasm in the black community appears to be way down amid questionable ads that Jones and his allies have run. “There doesn’t appear to be a lot of enthusiasm [among black voters for Jones],” Danny Ransom, the vice chair of the Civil Rights Activist Committee, told NBC News. The NBC story’s headline noted that there are not enough black voters in Alabama for Jones to beat Moore. “Doug Jones needs black voters to beat Roy Moore in Alabama. They aren’t there yet,” NBC News’ Alex Seitz-Wald’s headline reads. Nonetheless, Booker is just one of several high-profile black Democrats storming into Alabama to help Jones in the final days, per NBC’s report. Both Booker and Patrick are considered presidential contenders in 2020 on the Democratic side. And while these surrogates might help stop some of the bleeding Jones has endured in the black community after he and his allies put out racially charged flyers, Moore’s campaign told Breitbart News that the idea that Booker and others like Patrick are helpful to someone running in Alabama is just simply farcical. In other words, he might shore up a few more black votes, but Jones is now hemorrhaging support among white voters across the state who think Cory Booker’s politics are just so extremely leftist they are unacceptable to Alabama. Therein lies the problem facing Jones, a radical leftist Democrat who opposes everything President Trump and Republicans stand for. Alabama’s electorate is too far against Democrats and for Republicans for him to stand much of a chance. It’s next to impossible, given the demographics and make-up of the Alabama electorate, for Jones to be able to build a big enough coalition to win a statewide election as a Democrat. He would have to be perfect in election execution to survive, and even then perfection might not be enough. Jones, when presented the opportunity earlier in the campaign, as the allegations against Moore first broke, to actually be a moderate Democrat, could not resist showing his true hard radical leftist Democrat tendencies. His positions on everything from the Second Amendment to abortion to immigration to taxes to healthcare to education to the military and more have all come under scrutiny by Alabamians. Despite the media’s best efforts to portray him as a “moderate,” Jones has been unable to detail a single issue on which he would work with Republicans. On guns, he backs “limitations” to the Second Amendment. On abortion, he supports full-term—not just late-term—abortion, literally until the second a baby is born. On healthcare, he backs Obamacare. On education, he supports Common Core. On immigration, he opposes President Trump’s planned border wall and supports amnesty for illegal aliens–especially the so-called DACA ones. On taxes, he says he supports cuts but opposes the GOP’s tax plan that President Trump backs. On the military, Jones backs allowing transgender troops. Each of those issues and more pit Jones against the majority of Alabamians, and allow Moore plenty of room to appeal to those voters who may have gotten queasy backing him before the allegations against him disintegrated under scrutiny. He’s more like Bernie Sanders. He’s more like Dianne Feinstein than he is anyone from Alabama because he’s got such liberal values whether it’s the pro-life position, whether it’s the border, whether it’s taxes, on and on and on, he is more akin to them than anyone I’ve ever seen in Alabama. You know, the first public statement he makes after he wins his election and we were on to the general election was he says a woman should have the right to terminate a pregnancy at any point up to the moment of birth. So he says he’s a pro-lifer once the baby is born. That is the most extreme view I have ever heard and it’s coming from a man that claims to be from Alabama and I guess he is but he doesn’t represent Alabama values. He doesn’t represent what people are going to the polls next week for and vote for. Hillyard also reported that Jones has been attacking Moore for not holding many public events, as the GOP nominee’s last public appearance was a Tuesday evening rally with Bannon—Breitbart News’s Executive Chairman—in Fairhope, Alabama. Doug Jones in Montgomery on this race: "People know we have a unique opportunity the in the state of Alabama. It’s probably the best opportunity we’ve had in a generation or more." Doug Jones this aftn in Selma compared Roy Moore to a groundhog: "I can’t remember what day we’re in now where Roy Moore is in hiding. He comes out only to be seen—he’s kind of like the groundhog. He comes out every so often to see whether he can see his shadow." Doug Jones notes that Roy Moore "can't even get along with people in his own party"
Cory Booker is now talking about his "teenage swagger"
But Moore’s strategy of running out the clock appears to be working, as he has put the allegations against him in the rearview mirror and focuses on the issues in the home stretch. Moore aims to close out strong at an election eve rally just outside Dothan where Bannon and Gohmert will return to give him a final bump ahead of voting on Tuesday.